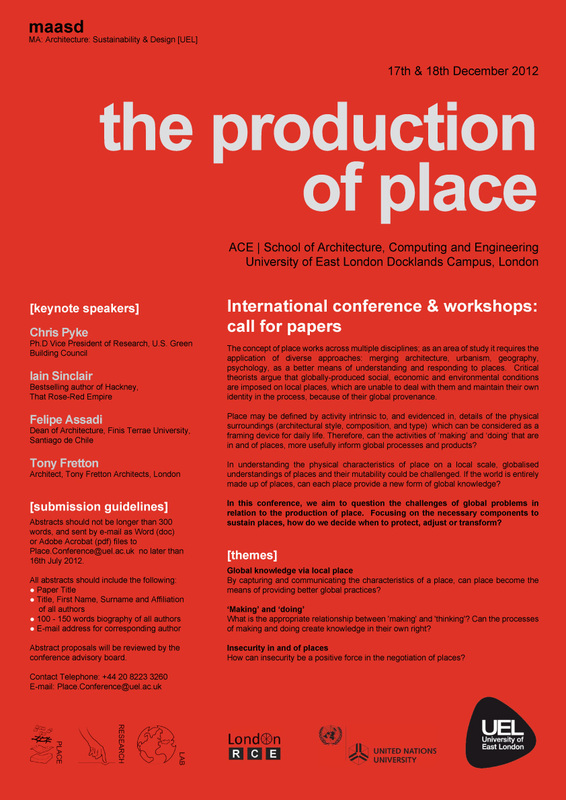 Focusing on the necessary components to sustain places, University of East London will run a four day workshop and conference on 15 – 18 December 2012. Guest speakers include architect Tony Fretton and writer Iain Sinclair, to help question the challenges of global problems in relation to the production of place. Led by MA: Architecture: Sustainability & Design (maasd) and Place Research Lab, the conference and workshops will run in parallel to each other. The workshops will run over four days and include fabric formwork concrete construction and other self-build techniques. Delegates will design and make structures, responding to the challenges of particular places, together with staff and students. The work will be presented during the conference. Submit papers by 16th July 2012. Abstracts should not be longer than 300 words, and sent by e-mail as Word (doc) or Adobe Acrobat (pdf) files to Place.Conference@uel.ac.uk no later than 16th July 2012. Abstract proposals will be reviewed by the conference advisory board.